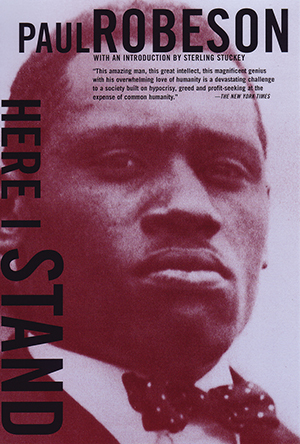 Robeson’s international achievements as a singer and actor in starring roles on stage and screen made him the most celebrated black American of his day, but his outspoken criticism of racism in the United States, his strong support of African independence, and his fascination with the Soviet Union placed him under the debilitating scrutiny of McCarthyism. Blacklisted, his famed voice silenced, Here I Stand offered a bold answer to his accusers. It remains today a defiant challenge to the prevailing fear and racism that continues to characterize American society.